Thank you to Henry Holt and Company for the advance copy. I am adding to my #library of book reviews. Auster structures his book into four sections, REPORT FROM THE INTERIOR, TWO BLOWS TO THE HEAD, TIME CAPSULE and ALBUM – each designed to represent the past as it produced Auster’s writing habits and his overall ideology of the world. And even though this book, like the last one masquerades as a memoir, it is much more creative than that. Not that I am against biographical works of any kind, but Auster’s style has never allowed him to follow simple conventions. He is an artist and is really trying to get to something more obscure about the writing of one’s past. DISCLAIMER, when Auster writes of his past, one must understand he does not mean simply to “tell the truth” about his life over the years, though there is certainly much of that. He means to show that his past comes into being at the moment of its writing. We know this because in the first section of the book, the one entitled, REPORT FROM THE INTERIOR, he speaks to himself then, in the past, in the second person, you, – he addresses himself. Yet, under normal conventions in writing, when authors use that address in their sentences, they are often addressing the reader. In this we come to understand that even though he is probably referring to himself as a 6-year old boy, the style works in the present tense. Rather, even as he is talking to “himself” with that address, the convention of you brings out the readerliness of his book. Yes, Auster is writing the words in his office on Brooklyn, but is also showing the reader that there is no story without the reader – even if it’s only him. Auster gets to have a slew of readers who have picked up the book from their local bookstore (hopefully) and he gets to objectify himself as a character in the book for them and himself because he is the one writing it. The REPORT…must have a reader to whom to deliver. The second section, TWO BLOWS TO THE HEAD, besides revealing Auster’s claims for having developed a social conscience because of cinema (two films to be examined below as they relate to Auster’s reading of them), also acts as an illusion (another post-modern trick) to that most Truffautian of all French New Wave films, François Truffaut’s, The 400 Blows (1959), in a way that can only refer to influence, though productive on his way of thinking and art, is also a trauma. If you see the film, you will understand the reason I use the word trauma. I have come to believe the word, trauma, has been used too simply. It is often used with negative connotations – as if trauma is something which stops development or growth in a person’s mind and body. Even The Oxford English Dictionary defines, “trauma, n” as, “a wound or external bodily injury“ (as it relates to physical pathology) and “a psychic injury…caused by emotional shock” (as it relates to psychoanalysis and psychiatry). But what we fail to understand with this simplistic definition is one’s life is made of one event or another – each of which influences how that person decides to interact with every next moment in their lives. The result is of course said person’s whole life. Yet somehow, we believe we can pick apart one set of experiences as wholly negative while others are categorized as positive. One is called trauma while the other is called influence. It is too simple to subdivide one part of one’s life from another. For example, Auster talks about his having developed a social conscience because of two films: The Incredible Shrinking Man (1957) and I am a Fugitive from a Chain Gang (1932). The first film is about a man who starts shrinking due to exposure to radiation. Oh, and may I emphasize the fact that this non-fiction “memoir” has an entire section dedicated to analyzing two films? But this is creative because he finds yet another mode to subvert the genre of the “autobiography.” What makes this film account interesting is Auster has essentially translated the film back into prose and narrates the film from his point of view – the watcher. He discusses the high-drama of the film, its slight horror-effect, and its science-fictional content – all things that come back to his writing later. But this is a film. The use of science-sounding technical terms in the film adds to his suspension of disbelief while watching the film. Plus, he realizes, sort of after the fact, but also while watching it as a young kid, that the film is a form of dramatic manipulation. The story is made of the elements in it – something Auster has followed closely through his books. He knows the act of writing a book, of collecting information for it, of making decisions for its production is as important as a the “final” product. It is almost as if there is no final product. The third section of REPORT FROM THE INTERIOR is called TIME CAPSULE and features an examination of personal papers, letters sent to his first wife, the author and translator Lydia Davis. I know who is current wife is, Siri Hustvedt, who by the way has a new book coming out in March 2014 called, The Blazing World. But I did not know his ex-wife was/is the talented experimental author Lydia Davis. This section accomplishes its goals – that of opening a “case” of objects from the past to see how one you relate to them way later. In this case, there are letters that Lydia Davis has about which she inquires if Auster is interested. The context for being asked about these letters is the creation of another archive – Lydia Davis has decided to donate her letters and papers to a research university library. Auster himself will probably do the same thing himself later. This is a TIME CAPSULE within a TIME CAPSULE within a TIME CAPSULE – three layers of objects of human expression. And, again, sneaky Auster, by writing that many authors give their papers to research libraries, he is again telling us that authors and their works are to be discussed, taken apart, filed, re-read and written about. Very meta indeed. The fourth and final section of REPORT FROM THE INTERIOR is called ALBUM and contains stills, images, promotional pictures and other works of art Auster mentions through his book. I can’t show any of them here, but he includes images from each of the two films, pictures of Edgar Allen Poe and Robert Louis Stevenson and photographs of news events and places he mentions travelling through in France. This section doubles as a personal archive put together for his readers to see. Eco already used a collection of images from the past in his book, The Mysterious Flame of Queen Loana (2004). In that book, however, Eco uses the images from the main character’s past (probably in part Eco’s own past) to force a recovery from amnesia upon the protagonist. Isn’t it interesting that Auster is also playing with images as representations in a post-modern “memory” book? Auster’s book is not a copy, but there is a precedent in international literature for Auster’s approach. This book strikes this author as very much a Paul Auster book. It is not boring at all. I did not feel, however, I was reading “just another Paul Auster” book. But one does come to see he can uses some tricks over time – even if they are used in new ways relative to the “memoir/auto-biography” genre. A version of this review is also viewable at LibraryThing. 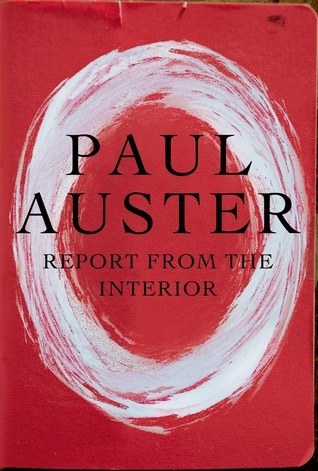 This entry was posted in book promotion, Book Reviews, LibraryThing and tagged books, literature, Paul Auster, postmodern literature, REPORT FROM THE INTERIOR.